Founded on the motto “A First Class Law School, or None at All” Gonzaga Law School opened its doors October 1, 1912. Two classrooms on the third floor of the Administration Building were set aside for the law school. The first dean, Edward J. Cannon and Professor Ben Kizer were appointed to the library committee and given the job of purchasing a complete law library. In the meantime, Dean Cannon arranged for students to use the Spokane County Bar Association Library. 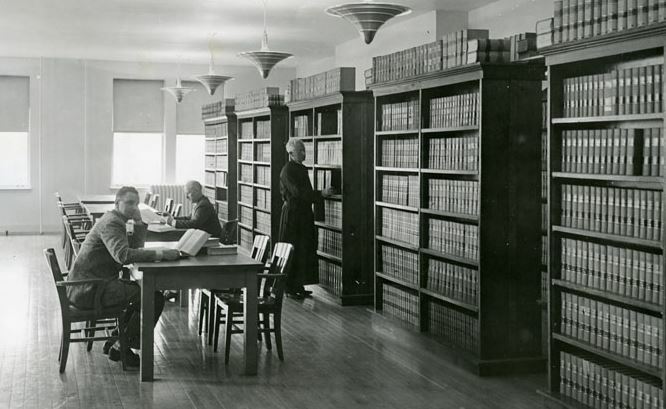 The law school’s 1913-14 catalogue promised that students would “have the use of a well-equipped working library separate from the other libraries of the University.” The law library developed steadily through the months. In January 1913 the library acquired Washington Statutes and Reports and the American Encyclopedia of Law. The 300 volume library, serving the first law class of 19 students, was then given its own room. As the law school grew, so did the law library. In 1937, University President Father Leo Robinson, S.J., raised $500 and bought duplicates from the county law library for 10 cents apiece. The library was moved to the third floor of the Administration Building. On December 10, 1941 (three days after Pearl Harbor) a fire started in the annex of the library. The apparent cause of the fire was cigarette butts in a garbage can. It took nearly a year to repair the damage, at a cost of $6,119.06. In the fall of 1948, Miss Emily Ehlinger was appointed the law library’s first full-time law librarian. The library continued to grow and it received many significant donations, such as the 6,000 volume legal library of State Supreme Court Justice W.H. Abel Montesano in 1953. The library had grown to 56,270 volumes. By 1962 the library claimed to be the “only law library in the country that never closes its doors.” Although the library was open 24 hours, the stacks were not open to students, making both students and the American Bar Association unhappy. Clearly, the law school was outgrowing its quarters. University President Father John Leary, S.J., seized the day when Spokane School District 81 put a nearby vacant grade school up for bid in July 1962. Webster School, built in 1901, had been the victim of a fire in 1945, been restored as a trade school, and finally left empty for several years. Father Leary acquired the building for $115,000. The old Webster school would be the home of the law library for the next thirty-eight years. Until the mid 1970s, the law library was open twenty-four hours a day, seven days a week, often unstaffed, on the honor system. In the 1970s, the law school, formerly a night school, began offering day classes. Explosive growth quickly followed. The law school underwent several renovations in the early 1970s. On November 7, 1971, a new wing of the library was dedicated. Further renovations in 1972 and 1973 also changed the shape of the library. By the 1990s, the law school occupied the old Webster school and several adjacent buildings. Under Dean John Clute, fundraising was begun to build a new law school. The class of 2000 was the last to graduate from the old law building. In late May 2000, the new Gonzaga Law School, on the banks of the Spokane River, opened its doors. The library is now named after a distinguished 1940 graduate and long time professor and friend of the law school and his wife, Chester and Catherine Herrick Chastek. Chastek Library now contains over 250,000 volumes and covers three floors of the new law school. Seven staff members meet the information and computing needs of the students and faculty by combining the best of traditional library practices with the best of technology, including databases, indexes, computer labs, and wireless access to the law school’s network. Chastek Library is now a modern library and computing center, providing access to not just its own collections, but to the collections of libraries worldwide. With a staff dedicated to meeting the research and information needs of the faculty and students, Chastek Library celebrates its past and looks forward to its future.